Henri Fantin-Latour (Born 1836) was born in Grenoble, France. He was an illustrator, printmaker, and painter renowned for his still lifes and portraits, especially of French celebrities in the arts. He received drawing lessons from his father when he was still a youth. He was admitted at the Ecole de Dessin at the age of 14 and studied art under the guidance of Lecoq de Boisbaudran. 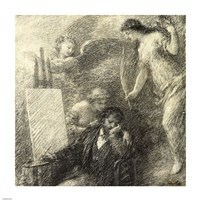 He again studied in Paris from 1854; and after completing his studies, he devoted much of his time to copying the works of the old masters. He befriended several of the young artists who were later associated with Impressionism, including Manet and Whistler - his own work remained conservative in style. It was Whistler brought the attention of Fantin-Latour to England, where his (Fantin-Latour’s) still-lifes sold so well that they became practically unknown in France during his lifetime. 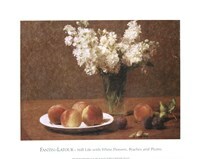 Fantin-Latour created ingenious lithographs in addition to his realistic paintings. These pieces of art were inspired by the music of some of the great classical composers. 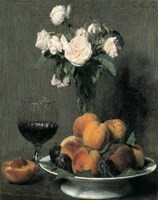 Fantin-Latour was academic in manner, but he was independent in style. 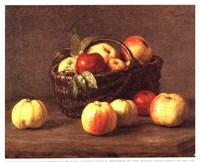 He made numerous friends including Gustave Courbet, Eugène Delacroix, J.-A.-D. Ingres, Édouard Manet and Camille Corot. All these friends were among the leading French painters of his day. His portrait groups are perhaps most interesting for the way they portray various artistic and literary persons of the time. He often arranged the in rows of figures and heads like seventeenth-century Dutch guild portraits. 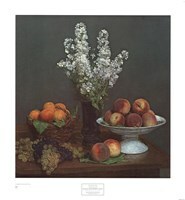 Fantin-Latour married Victoria Dubourg, a fellow painter in 1875.